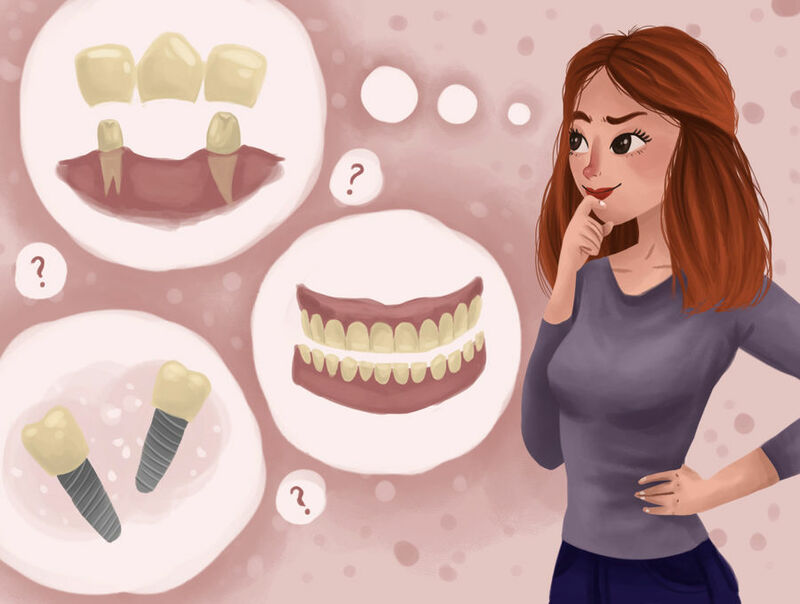 How will you replace your missing tooth? If you’re missing one or more teeth, you may be aware of their importance to your appearance and dental health. Your teeth work together to chew, speak, and smile. When some teeth are missing, it is difficult to perform these daily activities. Even the loss of a molar may cause your mouth to shift and your face to look older. Fortunately, a missing tooth can be replaced. The following are three important options a dentist may suggest, depending on your needs. Replacement teeth should last for years at a time, so it is important to choose a treatment that’s suitable for you. The Position of teeth immediately alters after a tooth is lost. If the tooth is not replaced, other teeth can drift out of position and change the bite. Shifting teeth can possibly lead to tooth decay and gum disease. Many patients go for Implants to replace a single tooth, many teeth, or to support a full set of dentures. Implants are surgically placed in the upper or lower jaw, where they perform as a sturdy anchor for replacement teeth. They are made of titanium (a strong, lightweight metal) and other materials also used that are accepted by the human body. Most patients experience that an implant is secure and stable—a suitable replacement for their own tooth. However, implants are not a suitable option for everyone. Because implants require surgery, patients should be in good general health. Patients either have adequate bone to support the implant or be able to have surgery to increase the area needing the implant. An implant is most alike to a natural tooth. Surrounding teeth do not have to be included in the placement procedure. Implants can last for many years, even decades. Some types of implants and false teeth or dentures can be placed in fewer visits. Implants may aid in preventing shrinkage of the jawbone from tooth loss. Implants are not right for everyone because they require surgery. Implant placement may take longer and may need more dental visits than other options. Implants may cost more than other methods. Another tooth replacement option is a fixed bridge. This is a restoration that fills the gap where one or more teeth is missing. A fixed bridge is cemented into place — only a dentist can remove when required. Cementing a bridge usually takes more than one dental visit. On your first visit, your dentist prepares the teeth on either side of the treatment place. The bridge will later be attached to these nearby teeth. Your teeth and space impression will be taken, send to a dental laboratory afterward. The bridge is made out of metal, ceramics, glass-ceramics or a combination. Your dentist will place a temporary bridge to protect your exposed teeth before cementing the permanent one. More expensive than removable bridges. The supporting tooth needs to be filed and prepared. may require extra effort to brush under the pontic. As its name describes, a removable partial denture can easily be taken out of the mouth when required. Partial dentures usually have replacement teeth fixed to a plastic base that matches the color of natural gums. The plastic base may cover a metal framework. Partial dentures often have some form of clasp that attaches to your healthy teeth. can be less stable than other options. they can break or be lost. can be uncomfortable if not fitted properly. some people not feel comfortable to take out their teeth at night and for cleaning. may need more frequent restores than other options. Prosthodontist – replacement and restoration of teeth. Oral and maxillofacial surgeon – dental surgery and treatment of the entire oral issues, including neck and face. Periodontist – treats gum (periodontal) diseases. Dr. Manan Dhulia Dental Director of Sabka dentist says “The option of the replacement depends upon the patient condition. It gives the best result when it is done according to his condition”. Dr. Rupali Gujar Dental Director of Sabka dentist says “every the position of the tooth also needs to considered while choosing the replacement options”. Dr. Reena Waghela Dental director of Sabka dentist says “Healthy tooth is important. In order to save the healthy tooth the gap should be filled”. Dr. Priyanka graduated in 2008, obtaining her BDS degree from the faculty of dentistry at the Maharashtra University of Health Sciences. Upon graduating, she was selected to complete a multi-disciplinary hospital residency at Government Dental College and Hospital, Mumbai. This residency provided her with advanced training in all the specialties of dentistry including oral surgery, endodontics, pedodontics, and treatment of medically compromised patients. Dr. Priyanka then moved to private practice, working as an associate dentist. Dr. Priyanka has a diploma in Soft Tissue Lasers from IALD and fellowship in Implant & Esthetic Dentistry. She also holds numerous certifications in Advanced Implant Dentistry, Endodontics, and Esthetic Dentistry. Dr. Priyanka completed MBA in Hospital Management and Clinical Research. Dr. Priyanka is a member of the Indian Dental Association and Dental Implantology Study Club, Pune. She has worked at Sabka Dentist since 2012 and is pleased to say that their advanced technology allows dentists to provide patients with painless, gentle dentistry and a pleasant experience. She enjoys the challenge of providing quality conservative family dentistry in a comfortable and friendly environment. How Important is your jaw’s health?